There are no reagents needed for regeneration. Automatic regeneration by electric current. Since there are no reagents, storage and processing is not required. There is no need to neutralize waste. The electric field reduces the growth of bacteria in the resin during service. There is no risk of cross-contamination with other resins. There is no negative impact on the environment. 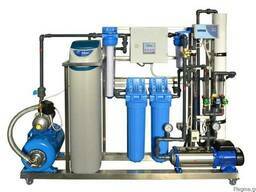 Continuous operation, stable water quality for a long time.